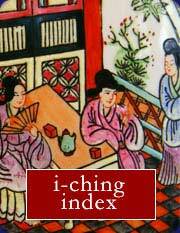 The I-Ching uses 64 hexagrams, each consisting of 6 broken or unbroken lines. Each hexagram can also be divided into an "upper" and a "lower" trigram each consisting of just 3 lines. The top 3 lines are called the "Upper Trigram". The lower 3 lines are called the "Lower Trigram"
The entire 6 line hexagram represents the primary message of an I Ching reading, but experts who search for a deeper meaning will often analyze the I Ching trigrams. Typically, a trigram interpretation is a secondary or minor interpretation that takes a back-seat to the overall interpretation of the hexagram itself. Some question-topics in particular, warrant consideration of the trigrams. 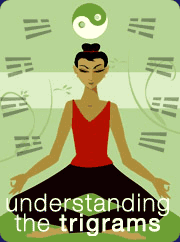 if you are searching for a reference to family members or compass directions, the trigrams can yield important clues. There are only 8 possible trigrams. They are: Heaven, Earth, Wind, Water, Thunder, Fire, Mountain and Lake. When you analyze your I-Ching hexagrams for their meanings, don't forget to also consider the additional meanings contained in the two inner trigrams. The trigram of Heaven is also known as 'The Creative'. It is a symbol of raw, supreme creative power. It is associated with strength and truth. It may also indicate a 'father' or 'fatherhood' or the direction 'northwest'. The trigram of Water is also known as 'The Abysmal' or 'The Gorge'. Water is ever-changing and shifting. This trigram is often a warning of uncertainty and dangerous motion. It is closely associated with the moon and the direction 'north'. The trigram of Thunder is both powerful and mysterious. In Chinese lore it is often associated with dragons. It is also called 'The Arousing' and indicates intent, movement and initiative. It may refer to an 'eldest son' or the 'north'. The trigram of Fire is sometimes called 'Attachment' or 'Dependence'. It is associated with light-giving and something that is both adaptable and relied upon. It may indicate a 'second daughter' or possibly the direction 'south'. The trigram of the "Mountain"
The trigram of the Mountain represents stillness and something that can not be moved. It is powerful, silent and eternal. Its attributes are restful and peaceful. It may also represent a 'third-born son' or the direction 'northeast'. The trigram of the "Lake"
The trigram of The Lake is a symbol of joy and openness. Tranquility is referenced here, along with devotion and calm. The Lake may also indicate a 'third daughter' or the direction 'west'.